It's my birthday month and what better way to celebrate than with free stuff! I've gotten a bunch of freebies in my email box this month and I wanted to share my very favorites with you guys! Chappy's Deli : Join Chappy's Deli E-club for a coupon for a free sandwich or salad on your birthday. CVS: Sign up for CVS Beauty Club for a $3 off any purchase coupon on your birthday. Gigi's Cupcakes: Sign up for a free cupcake when you join and then a free cupcake on your birthday plus other special offers. Red Robin: Sign up for Red Robin Royalty rewards for a free birthday burger, surprises and other special offers. Ruby Tuesday: Join Ruby Tuesday's So Connected email club for a free appetizer, special offers and a free burger on your birthday. Toys R Us: Sign your kids 10 and under up for Geoffrey's Birthday Club. Members receive a birthday card and gift from Geoffrey. Bring your birthday child into the store to receive a birthday crown, Geoffrey balloon and a personalized announcement broadcast to the entire store! Plus during in store birthday events, members receive special surprises with coupon including a Geoffrey plush toy and storybook. Ulta Beauty: Join Ultamate Rewards for a free gift on your birthday. I had not signed up for this one yet so I don't know what the gift is. Zaxby’s: Kids 10 and under can join the Zax Kidz Club and receive a free cookie club in the mail just for joining and a free kidz meal card mailed on their birthday; Adults can join the Zaxby’s Mail club and will receive via mail a members-only FREE Meal Deal coupon to the address you provide within six weeks of joining and a free Nibbler on your birthday. I got a card in the mail for the free Nibbler. Just saying: Offers can change, so check before you sign up. 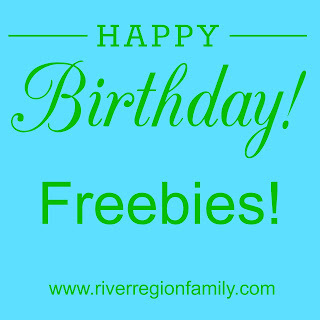 If you know of any other great birthday freebies, let me know so I can add them to this list and share the love!